Introduction India holds an important place in the global education industry. India has one of the largest networks of higher education institutions in the world. Market Size India has the world’s largest population of about 500 million in the age bracket of 5-24 years The education sector in India is estimated at US$ 91.7 billion in FY18 and is expected to reach US$ 101.1 billion in FY19. Number of colleges and universities in India reached 39,050 and 903, respectively in 2017-18. India had 36.64 million students enrolled in higher education in 2017-18. Gross Enrolment Ratio in higher education reached 25.8 per cent in 2017-18. The country has become the second largest market for e-learning after the US. The sector is expected to reach US$ 1.96 billion by 2021 with around 9.5 million users. 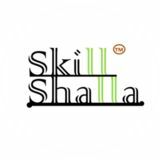 Skill Shalla Foundation is engaged in vocational skill training. It is the only organisation in India which provides instructor led training to students on vocational skills at their respective schools. It is a collaborative endeavor between faculty, fellow aspirants, training associates and students as a whole. It primarily operate through modules which are purely based on fun & adventure packed activities and games. 1 Activities: All Activities are aimed at building confidence for public speaking, planning, team-building, coordinating, presentation, group-discussion, brainstorming and analytics. 2 Games: All games are made with utmost care to deliver the desired outcome. 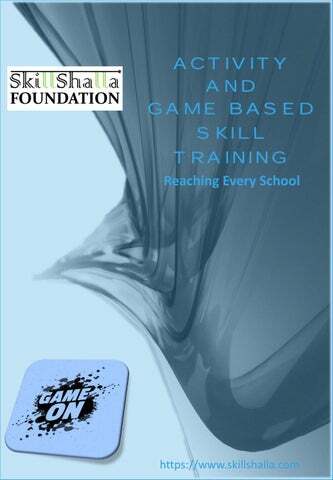 Games are meant for tuning the design thinking, mind mapping, motivating, boosting creativity and positive aptitude. Supports School Management in organising events, workshops, carnivals / fairs. We can bring-in corporate sponsorships for various school events. â&#x20AC;&#x153;Post training and International certification, the trainee gets opportunity to do internship with various companies. Others from rural areas can become our representative for their own location.â&#x20AC;? Product and Process Training Rs. 6,000.00 It Includes 360 degree service support. starting from identifying training needs till delivery of training and post training impact monitoring. Min. 5 participants needed. Induction Training (Staff) Introduction to Tally Rs. 2,000.00 Rs. 4,000.00 Its per person cost per day. Basic Tally + GST Billing + Return Minimum participants need to filing process be 5 persons or minimum payment need to be Rs.10000/-. Unified Council is a professionally managed progressive organisation in the field of education, established in the year 1998 by eminent personalities from various fields, including some academicians of international repute. Since its inception, Unified Council has brought together, the best brains in the field of education, in an endeavor to make the younger generation fundamentally stronger and to nourish their brains for a bright and enterprising future.